"I have a secret to tell you, dear, and this is it: I am not Mary. That is a mistake. I am not a girl. I'm a boy." Mary's fight to become Martin, her claustrophobic small town, and her troubled family make up the core of this remarkable and intimate, emotional yet unsentimental novel. As daring as Virginia Woolf's Orlando, Sacred Country inspires us to reconsider the essence of gender, and proposes new insights in the unraveling of that timeless malady known as the human condition. As Mary's mother, Estelle, observes, "There are no whole truths, just as there is no heart of the onion. There are only the dreams of the individual mind." 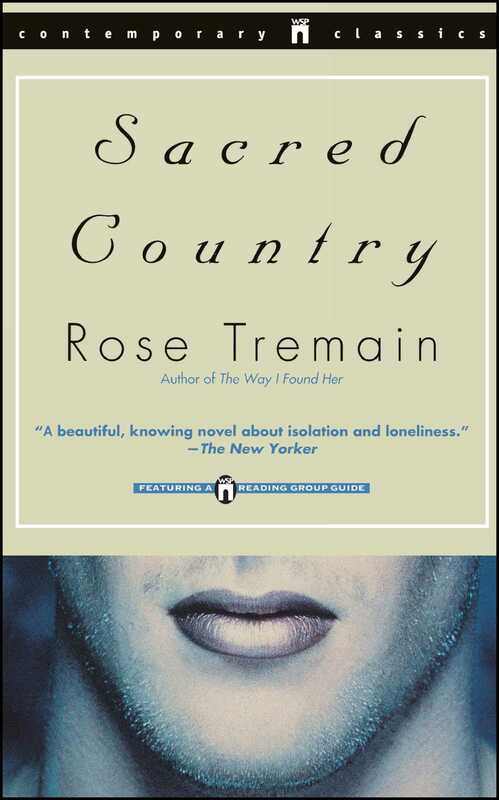 Sweeping us through three decades, from the repressive English countryside of the fifties to the swinging London of the sixties to the rhinestone tackiness of seventies America, Rose Tremain unmasks the "sacred country" within us all. On February 15th, 1952, at two o'clock in the afternoon, the nation fell silent for two minutes in honour of the dead king. It was the day of his burial. Traffic halted. Telephones did not ring. Along the radio airwaves came only hushed white noise. In the street markets, the selling of nylons paused. In the Ritz, the serving of luncheon was temporarily suspended. The waiters stood to attention with napkins folded over their arms. To some, caught on a stationary bus, at a loom gone suddenly still, or at a brass band rehearsal momentarily soundless, the silence was heavy with eternity. Many people wept and they wept not merely for the king but for themselves and for England: for the long, ghastly passing of time. On the Suffolk farms, a light wet snow began to fall like salt. The Ward family stood in a field close together. Sonny Ward had not known -- because the minute hand had fallen off his watch -- at what precise moment to begin the silence. His wife, Estelle, hadn't wanted them to stand round like this out in the grey cold. She'd suggested they stay indoors with a fire to cheer them and the wireless to tell them what to do, but Sonny had said no, they should be out under the sky, to give their prayers an easier route upwards. He said the people of England owed it to the wretched king to speak out for him so that at least he wouldn't stammer in Heaven. So there they were, gathered round in a potato field: Sonny and Estelle, their daughter, Mary, and their little son, Tim. Pathetic, Sonny thought they looked, pathetic and poor. And the suspicion that his family's silence was not properly synchronised with that of the nation as a whole annoyed Sonny for a long time afterwards. He'd asked his neighbour, Ernie Loomis, to tell him when to begin it, but Loomis had forgotten. Sonny had wondered whether there wouldn't be some sign -- a piece of sky writing or a siren from Lowestoft -- to give him the order, but none came, so when the hour hand of his watch covered the two, he put down his hoe and said: "Right. We'll have the silence now." The salt snow fell on their shoulders. It was a silence within a silence already there, but nobody except Mary knew that its memory would last a lifetime. Mary Ward was six years old. She had small feet and hands and a flat, round face that reminded her mother of a sunflower. Her straight brown hair was held back from her forehead by a tortoiseshell slide. She wore round glasses to correct her faulty vision. The arms of these spectacles pinched the backs of her ears. On the day of the silence she was wearing a tweed coat too short for her, purple mittens, Wellingtons and a woollen head scarf patterned with windmills and blue Dutchmen. Her father, glancing at her blinking vacantly in the sleet, thought her a sad sight. She had been told to think about King George and pray for him. All she could remember of the king was his head, cut off at the neck on the twopenny stamp, so she started to pray for the stamp, but these prayers got dull and flew away and she turned her head this way and that, wondering if she wasn't going to see, at the edge of her hopeless vision, her pet guineafowl, Marguerite, pecking her dainty way over the ploughed earth. Estelle, that very morning, had inadvertently sewn a hunk of her thick black hair to some parachute silk with her sewing machine. She had screamed when she saw what she'd done. It was grotesque. It was like a crime against herself. And though now, in the silence, Estelle made herself be quiet, she could still hear her voice screaming somewhere far away. Her head was bowed, but she saw Sonny look up, first at Mary and then at her. And so instead of seeing the dead king lying smart in his naval uniform, she saw herself as she was at that precise moment, big in the flat landscape, beautiful in spite of her hacked hair, a mystery, a woman failing and failing through time and the fall endless and icy. She put her palms together, seeking calm. "At teatime," she whispered, "I shall do that new recipe for flapjacks." She believed her whispering was soundless, but it was not. Estelle's mind often had difficulty distinguishing between thoughts and words said aloud. Sonny banged his worn flat cap against his thigh. He began to cough. "Shut you up, Estelle!" he said through the cough. "Or else we'll have to start the silence again." Estelle put her hands against her lips and closed her eyes. When Sonny's cough subsided, he looked down at Tim. Tim, his treasure. Timmy, his boy. The child had sat down on a furrow and was trying to unlace his little boots. Sonny watched as one boot was tugged off, pulling with it a grey sock and revealing Timmy's foot. To Sonny, the soft foot looked boneless. Tim stuck it into the mud, throwing the boot away like a toy. "Tim!" hissed Mary. "Don't be bad!" "Shut you up, girl!" said Sonny. "I can't hear any silence at all," said Estelle. "Begin it again," ordered Sonny. So Mary thought, how many minutes is it going to be? Will it get dark with us still standing here? And then the idea of them waiting there in the field, the snow little by little settling on them and whitening them over, gave Mary a strange feeling of exaltation, as if something were about to happen to her that had never happened to anybody in the history of Suffolk or the world. She tried another prayer for the king, but the words blew away like paper. She wiped the sleet from her glasses with the back of her mittened hand. She stared at her family, took them in, one, two, three of them, quiet at last but not as still as they were meant to be, not still like the plumed men guarding the king's coffin, not still like bulrushes in a lake. And then, hearing the familiar screech of her guineafowl coming from near the farmhouse, she thought, I have some news for you, Marguerite, I have a secret to tell you, dear, and this is it; I am not Mary. That is a mistake. I am not a girl. I'm a boy. This was how and when it began, the long journey of Mary Ward. It began in an unsynchronised silence the duration of which no one could determine, for just as Sonny hadn't known when to begin it, so he couldn't tell when to end it. He just let his family stand out there in the sleet, waiting, and the waiting felt like a long time. In April that year, Sonny lost eleven lambs to freezing weather. Anger always made him deaf. The more angry he grew, the louder he shouted. Part of his left ear had been shot off in the war. He'd seen a small piece of himself floating away on the waters of the Rhine. What remained was a branching bit of cartilage, like soft coral. In his deaf rages, Sonny would gouge at the coral with his thumb, making blood run down his neck. Sonny took the frozen lambs to his neighbour, Ernie Loomis, to be butchered and stored in his cold room. On Sonny's farm nothing was allowed to go to waste. And he couldn't bear the way Estelle was becoming careless with things in the house, so absent-minded about everything that sometimes she forgot what she was holding in her hands. He wanted to hit her when this happened, hit her head to wake her thoughts up. That day when she'd sewn her hair to the piece of silk, he'd made her unpick the seam, stitch by stitch with a razor blade, until all the hair was out. In a silver frame on the kitchen mantelpiece Estelle kept a photograph of her mother. She had been a piano teacher. The photograph showed her as she'd been in 1935, a year before her sudden death in a glider. She had belonged to the Women's League of Health and Beauty and this was how she remained in Estelle's mind -- healthy, with her hair wavy and gleaming, beautiful with a gentle smile. "Gliders, you know," Estelle had once told Mary in the whispery voice she used when she talked about her mother, "are also, in fact, very beautiful things." And it was suggested to Mary, even after she began wearing her glasses, that she had some of Grandma Livia's looks. "I think," Estelle would murmur, "that you will grow up to be quite like her." Mary was fond of the photograph of her grandmother. She looked quiet and peaceful and Mary was fairly sure she hadn't said thoughts out loud. And when she thought about her death in the glider, she didn't imagine it crashing into a wood or plummeting down onto a village; she dreamed of it just drifting away into a white sky, at first a speck, white on white, then merging into the sky, dissolving and gone. But she had never been able to imagine herself growing up to be like Grandma Livia. She knew she would not become beautiful or join the Women's League, whatever a Women's League might be. And after the day of the two-minute silence, she knew she would not even be a woman. She didn't tell her mother this and naturally she didn't tell her father because since the age of three she had told him nothing at all. She didn't even tell Miss McRae, her teacher. She decided it was a secret. She just whispered it once to Marguerite and Marguerite opened her beak and screeched. After the death of the lambs, some warm weather came. In May, the community of Swaithey held its annual fete in a field outside the village, well shaded by a line of chestnut trees. These fetes always had as their main attraction a competition of some sort: Best Flower Arrangement, Child's Most Original Fancy Dress, Largest Vegetable, Most Obedient Dog, Most Talented Waltzer and Quickstepper. Prizes were generous: a dozen bottles of stout, a year's subscription to Radio Fun or Flix, a sack of coal. This year there was to be a competition to find Swaithey's Most Beautiful Baby. Entry coupons were threepence, the prize unknown. Estelle's faulty imagination was tantalised by the idea of an unknown prize. The word "unknown" seemed to promise something of value: a visit to the Tower of London, a Jacqmar scarf, a meeting with Mr. Churchill. She had no baby to enter, yet she refused to let this precious unknown elude her altogether. She bought an entry coupon and took it to her friend, Irene Simmonds. Irene lived alone with her illegitimate baby, Pearl. The father had been Irish and worked "in the print" in Dublin. "He tasted of the dye," Irene had told Estelle, but the taste quickly faded and was gone and no word, printed or otherwise, came out of Dublin in answer to Irene's letters. She was a practical woman. She had an ample smile and a plump body and a heart of mud. For a long time, she dreamed of the Irish printer but her dreams never showed. All that showed was her devotion to Pearl. When Estelle came with the threepenny coupon, Irene was feeding Pearl. Her white breasts were larger than the baby's head. They could have nourished a tribe. Pearl's little life was lived in a sweet, milky oblivion. Estelle sat down with Irene and put the entry ticket on the kitchen table. "The unknown," she said, "is always likely to be better." Irene filled out the coupon, in the careful handwriting she'd perfected to try to win the printer's devotion: Entrant: Pearl Simmonds, Born April the 22nd, 1951. While she did this, Estelle took Pearl on her lap and looked at her, trying to imagine herself as a judge of Swaithey's Most Beautiful Baby. Pearl's hair was as pale as lemonade. Her eyes were large and blue and liquid. Her mouth was fine like Irene's, with the same sweetness to it. "You must win, cherub," Estelle instructed Pearl, "our hopes are on you." Sonny refused to go to the fête. He had no money to spare on trifles, no time to waste on fancy dress of any kind. Estelle went in the pony cart with Mary and Tim. It was a hot day, a record for May, the wireless said. The lanes were snowy with Damsel's Lace. Mary wore a new dress made from a remnant and hand-smocked by Estelle. In the pony cart she began to detest the feel of the smocking against her chest and kept clawing at it. They stopped at Irene's cottage. Pearl was sleeping in a wicker basket, wrapped in her white christening shawl. They laid the basket on some sacks that smelled of barley. After a bit, Pearl began to snore. Mary had never heard anyone snore except her father, let alone a baby. "Why is she?" Mary asked Irene. "Oh," said Irene, "she's always been a snorer, right from the off." Mary knelt down in the cart and looked at Pearl. The snoring entranced her so, it took her mind off the smocking. The Beautiful Baby Contest was to be held in a large green tent, ex-army. The mothers would line up on hard chairs and hold their babies aloft as the judges passed. From thirty-six entrants, five would be selected for a second round. There would be one winner and four consolation prizes. All the way there in the cart, Estelle thought about the word "consolation" and how she didn't like it at all. Things which promised to console never did any such thing. The afternoon grew hotter and hotter, as if all of June and July were being crammed into this single day. At the tombola Estelle won a chocolate cake which began to melt, so she told Mary and Tim to eat it. There was no breeze to make the home-made bunting flutter. Towards two o'clock, Irene took Pearl to the shade of the chestnuts to give her a drink of rosehip syrup and to change her nappy. Mary asked to go with her. The heat and the smocking had made her chest itch so much she had scratched it raw and now little circles of blood were visible among the silky stitches. She wanted to show Irene these blood beads. Being with Irene was, for Mary, like being inside some kind of shelter that you'd made yourself. It was quiet. Nobody shouted. Irene examined the blood on the smocking. She undid Mary's dress and bathed the scratches with the damp rags she carried for cleaning up Pearl. "There's hours of work in smocking, Mary," Irene said. They said nothing more. Irene fastened the dress again, kneeling by Mary on the cool grass. She held her shoulders and looked at her. Mary's glasses were dirty and misted up, her thin hair lay damp round her head like a cap. Irene understood that she was refusing to cry. "Right," she said, "now we have to get Pearl ready to be beautiful." She handed Mary a clean square of white towelling and Mary laid it carefully on the grass. She smoothed it down before she folded it. Irene took off Pearl's wet nappy and laid Pearl on the clean folded square. She took out of her bag a tin of talcum and powdered Pearl's bottom until the shiny flesh was velvety and dry. Mary watched. There was something about Pearl that mesmerised her. It was as if Pearl were a lantern slide and Mary sitting on a chair in the dark. Mary took off her glasses. Without them, it seemed to her that there were two Pearls, or almost two, lying in the chestnut shade, and Mary heard herself say a thought aloud, like her mother did. "If there were two," she said to Irene, "then there would be one for you and one for me." But Mary stopped. She attached her glasses to her ears. "Oh," she said, "I don't know what I meant. I expect I was thinking about the cake Mother won, because you didn't eat any." "It's hot," said Irene, fastening the safety pin of Pearl's nappy. "It's going to be sweltering in that tent." The mothers crowded in. There were far more mothers than chairs, so some had to stand, faint from the burning afternoon and the weight of the babies. The judges' opening remarks could hardly be heard above the crying. Lady Elliot from Swaithey Hall, neat in her Jacqmar scarf, said she had never seen such a crowd of pretty tots. She said: "Now I and my fellow judges are going to pass among you and on our second passing we will give out rosettes to the final five." There was laughter at the idea of the rosettes. The babies were hushed by this sudden ripple of noise. Estelle, with Mary and Tim, stood by the one of the tent flaps, praying for a breeze and for the unknown to arrive in Irene's lap. Mary had her eyes closed. She felt a sudden sorrowful fury. She didn't want there to be a contest after all. The judges barely looked at Pearl. They walked on with just a glance and the only thing that came to Irene waiting patiently on her chair was a waft of French perfume as Lady Elliot passed. The competition was won by a Mrs. Nora Flynn. The unknown became a trug and trowel, and Mrs. Nora Flynn laid her baby, Sally Mahonia, in the trug, like a prize cabbage. On the way home in the cart, Irene seemed as content as if the day had never been. Timmy was silent, pale from an afternoon like a dream, tugged here and there and seeing nothing but shimmer. Estelle said bitterly that a trug and trowel could not be classified as "unknown" and she drove the pony at a slow, disappointed pace. Mary said: "I didn't clap when that Sally Mahonia won. I didn't clap at all." And then, tired out from scratching her chest and eating cake and wanting Pearl to be recognised as the Most Beautiful Baby in Swaithey, she fell asleep in Irene's lap. Pearl, unvisited by any thoughts, slept near her on the barley sacks, softly snoring. I can remember way back, almost to when I was born. I can remember lying in my parents' bed, jammed between them. It was an iron bed with a sag in the middle. They put me into the sag and gravity made them fall towards me, wedging me in. Our land was full of stones. As soon as I could walk, I was given a bucket with a picture of a starfish on it and told to pick stones out of the earth. My father would walk ahead with a big pail that was soon so heavy he could barely carry it. I think he thought about stones all the time and he tried to make me think about them all the time. I was supposed to take my starfish bucket with me wherever I went and have my mind on the stones. I can remember getting lost in a flat field. It was winter and the dark came round me and hid me from everything and swallowed up my voice. The only thing I could see was my bucket, which had a little gleam on it, and the only thing I could hear was the wind in the firs. I began to walk towards the wind, calling to my father. I walked right into the trees. They sighed and sighed. I put my arms round one of the scratchy fir trunks and stayed there, waiting. I thought Jesus might come through the wood holding up a lantern. My parents came and found me with torches. My mother was sobbing. My father picked me up and wrapped me inside his old coat that smelled of seed. He said: "Mary, why didn't you stay where you were?" I said: "My bucket is lost on the field." My father said: "Never mind about the bucket. You're the one." But when I was three, I was no longer the one. Tim was born and my father kept saying the arrival of Timmy was a miracle. I asked my mother whether I had been a miracle and she said: "Oh, men are like that, especially farmers. Pay no heed." But after Timmy came, everything changed. My mother and father used to put him between them in their sagging bed and fall towards him. When I saw this, I warned them I would kick Timmy to death; I said I would put his pod through the mangle. So my father began to think me evil. I'd go and tell him things and he'd say: "Don't talk to me, Mary. Don't you talk to me." So I stopped talking to him at all. When we went stone picking together, we would go up and down the furrows, up and down, up and down, with each of our minds locked away from the other. My vision began to be faulty soon after Timmy was born. I would see light bouncing at the corner of my eye. Distant things like birds became invisible. People would separate and become two of themselves. I tried to tell my mother how peculiar everything was becoming. She was going through a phase of needing to touch surfaces all the time. Her favourite surface was the wheel of the sewing machine and her long, white thumb would go round and round it, like something trapped. When I told her about people becoming two of themselves, she put her hand fiercely over my mouth. "Ssh!" she said. "Don't. I'm superstitious." So it was my teacher, Miss McRae at the village school, who discovered my faulty vision. She told my mother: "Mary cannot see the blackboard, Mrs. Ward." Which was true. The blackboard was like a waterfall to me. I went with my mother on a bus from Swaithey to Leiston to see an oculist. The bus had to make an extra stop to let some ducks cross the road. I ran to the driver's window so that I could see the ducks, but all I could see were five blobs creeping along like caterpillars. A week later I got my glasses. Timmy laughed at me with them on, so I hit his ear. I hoped I'd hit him so hard his vision would go faulty too. "How are they, then?" asked my father crossly, holding Timmy. "They are a miracle," I said. Miss McRae looked like a person made of bark. Her back was as straight and as thin as a comb. Her nose was fierce. Her long hands were hard and freckled. Every child in that school was afraid of Miss McRae when they first saw her. They thought if they went near her, they'd be scratched. But when she spoke, her Scottish voice brought a feeling of peace into the room and everyone was quiet. She began every day with a story of something she'd done when she was a girl, as if she knew she looked to us like a person who had never been a child. The first words I heard her say were: "When I was a lass, I lived in a lighthouse." And after that I liked Miss McRae and began to tell her some of the things I refused to tell my father. That summer, sometime after the Beautiful Baby Contest, Miss McRae said to us: "Now, class, on Monday, I want you each to bring something to school. I want you to bring in something that is important or precious to you, or just something pretty that you like. And then I want you to tell me and the other children why you like it or why it is precious to you. It can be anything you like. No one need be afraid of looking silly. All you have to remember is to be able to say why you've chosen it." On the way home from school, I began to think about what I would take as my precious thing. When I'd been born, my mother had given me a silver chain with a silver and glass locket on it. Inside the locket was a piece of Grandmother Livia's hair and my mother had said recently that I should treasure this locket for always and that, if I ever wore it, I should touch it every ten minutes to make certain it was still round my neck. I used to look at it sometimes. It made me wonder what Grandma Livia had been wearing round her neck when she got into the glider. I thought it was the kind of thing Miss McRae would like and I could hear her say approvingly: "What a pretty wee thing, Mary." But it wasn't really precious to me. And if a thing isn't precious to you then it isn't and that's it; it won't become precious suddenly between Friday and Monday. When I got home from school, I looked around my room. I thought I might find something precious I'd forgotten about. But there was hardly anything in my room: just my bed, which had come out of a cottage hospital sale, and a table with a lamp on it and a huge old wardrobe, in which I kept my sweet tin and my spelling book and my boots. The tin had a picture of a Swiss chalet on it. It contained at that time two ounces of sherbert lemons and three Macintoshes toffees. I got it out and put a sherbert lemon into my mouth. I thought the little burst of sherbert might wake me up to the preciousness of something, but it didn't and then I had this thought: no one has ever told me where Grandma Livia was going in that glider. Was she just going to Ipswich or was she going to the Tyrrhenian Sea? By Sunday evening, after looking in my mother's sewing basket and in her button box and in all the crannies of the house where an important thing might have hidden itself and finding nothing, I decided that I couldn't go to school the next day. I would walk a long way from our farm. I would find a hayfield coming to its second cropping and I would sit in it and think about my coming life as a boy. I would examine myself for signs. Or I might climb a tree and stay there out of reach of everyone and everything, including all the stones in the soil. For my mid-day dinner, my mother made me pickle sandwiches and a thermos of lemon squash. In the winter, the thermos had tea in it and the taste of the tea lingered over into the summer and came into the lemon squash, tepid and strange. At the bottom of our lane, instead of turning left towards Swaithey and school, I turned right and began to run. I kept running until I was beyond the fields that were ours and then I stopped under a signpost and sat down. It was very hot there, even in that early morning sun. I drank some of my lemon squash. And then after about five minutes I got up and began tearing back the way I had come. I had remembered my precious thing. I was late for the class. I had had some trouble on the way with Irene, who said: "What are you thinking of, Mary Ward? Whatever are you like?" "Please, Irene," I begged. "Please." I was in Mr. Harker's house, where Irene worked. Mr. Harker had turned his cellar into a factory where he made cricket bats. The smell of wood and oil came up into all the rooms. A painted sign on his gate said: HARKER'S BATS. "It'd only be for half an hour," I pleaded. "No," said Irene. "Now run along to school." But I got her in the end: Pearl, my precious thing. I carried her like a big vase with both my arms round her. Miss McRae took her glasses off and frowned and said, "Whatever in the world, Mary?" Lots of children giggled. I opened my desk top and laid Pearl down in my desk with her head on my arithmetic book. I closed my ears and my mind to everybody laughing. Pearl gazed at me. She looked frightened. I don't suppose she'd ever been in a desk before. I gave her a little wooden ruler to play with but she hit herself on the nose with it and began to cry. "My, my," I heard Miss McRae say, "this is very irregular, Mary. Will you tell me please what this baby is doing in my lesson?" I had to pick Pearl up to stop her crying. The boy who sat next to me, Billy Bateman, was laughing so hard he asked to be excused. I looked over to his desk and saw that he'd brought in a stamp album, all mutilated and failing apart, as if it had belonged to Noah. When I'm a boy, I thought, I'll be a more interesting one than him. I felt my heart jump about inside my aertex blouse. I felt thirsty and very peculiarly sad. I thought I might cry, which was a thing I never did, but sometimes you cry with your face and your mind isn't in it, but somewhere else, watching you. It was like that. It was my face that felt sad. The thing was, I didn't know what to say about Pearl. I didn't understand why she was important to me, except that I thought she was very beautiful and I still couldn't see why she hadn't won that contest. I held her awkwardly. When Timmy was born, my mother had tried to show me how to hold a baby, but I'd refused to listen. I thought, I must say something before Pearl slips out of my arms. "Is this baby your precious thing, Mary?" asked Miss McRae kindly. "I see, dear," she said, "well in that case, perhaps you will be able to tell the class why?" Pearl, at that moment, let her head fall onto my shoulder, as if she wanted to go to sleep and start snoring. Her hand was still on my cheek, holding on to it. I said: "Her name's Pearl. I was going to bring this locket with some of my grandmother's hair in it." "And I wonder if you can tell us why, Mary?" "But you can't say it properly. Like my mother can't. If you asked her to bring in a thing, she'd have maybe brought in her sewing machine." Miss McRae waited. After a bit, she understood that I couldn't say anything more so she nodded gravely. My face was boiling red. I thought I might be going to explode and see my insides splatter out all over my desk and all over Billy Bateman's stamp album. I asked if I could sit down and Miss McRae said yes, so I sat and watched the next child go up with her precious thing. It was my so-called friend, Judy Weaver. She'd brought an ugly little salmon-coloured doll, dressed as a fairy. I'd seen this doll standing on the window sill in her parents' bathroom. It was a toilet-roll cover. You stuffed the doll's thin legs down the cardboard tube and her gauzy skirt went over the paper, hiding it from view. After that day of the Precious Things, I didn't want Judy Weaver as a friend any more. I didn't want any friends. None. For four generations, the Loomis family had lived in Swaithey. Their shop, Arthur Loomis &amp; Son, Family Butchers, had opened in 1861. A faded photograph of old Arthur, wearing a long apron and holding a tray of dressed game, now hung in the shop window above the pork joints and the skinned rabbits and the bowls of tripe. Smiling and plump, with a thick moustache, he looked like a man fattening himself up for eternity. All the generations of sons who followed him and kept the business thriving had heard Arthur Loomis speak to them in their sleep. It was as if every one of them had got to know him in time. Ernie Loomis, the present proprietor, born twelve years after Arthur had died, could describe his voice. "Nice and slow," he said it was, "and nice and gentle." Behind the shop was the cold room and behind this, hidden from sight by a high wall, was the slaughtering yard. The animals were strung up by their hind legs on a pulley. Their blood flowed into a gully and from there into a drain which debouched into a soakaway under the very field the heifers grazed in summer. In one corner of this field lived Ernie Loomis's brother, Pete. His home was a converted trolley bus, its roof pitched and thatched. Between Pete's living room and his cramped kitchen was a sign which read: PUSH BUTTON ONCE TO STOP BUS. Nobody much except the family knew Pete Loomis. He worked in the slaughtering yard or in the fields, never in the shop. The iris of his left eye wandered, so that he could seldom look square at a person, yet at the moment of a slaughter his eyes aligned themselves and he slit with precision. He had no wife or child. He'd spent some time in the American South. There were rumours of a long-ago crime. In the village drapers, where he bought his underwear, the Misses Cunningham referred to him as "a most uncustomary man." Yet he was a boon to Ernie. Ernie had never liked the yard. His art was in dead meat. The gentry of East Suffolk knew him by name, as he knew them. His voice, like his ancestor's, was quiet, his fingers nimble. He was diligent, ordered and clean. Every morning, he got up at five and brought his wife, Grace, a cup of tea and kissed her forehead, moist from her night. By six he was at his block and at eight the shutters of the shop went up. All day long, while Ernie passed between block and counter, Grace sat in a little booth with her cash register and her book of accounts. When there was no one in the shop, Ernie would talk to her through the glass. Ernie and Grace had one child, Walter. At sixteen, he resembled Pete more than Ernie. He had a dreamy look. His hair was thick and black, like Pete's. His cheeks had a high colour. His spelling was poor and his handwriting laboured. As a child, he'd grown much too fast and the pain of this growing had been felt in every one of his bones. But now it had stopped. He hoped there wouldn't be another spurt of it. He let his limbs relax and get ready for life. He noticed then, when he could listen to what was outside his pain, that his singing voice was rather fine -- so peculiarly fine he felt it couldn't possibly belong to him. He sang as he worked, sometimes helping his parents in the shop, but more often mucking out the pig sties and feeding the hens or working with Pete in the yard. He didn't know the words to many songs, only the things he'd grown up with: old soupy ballads such as "The Minstrel Boy" and "Barbara Allen" and some of the wartime favourites his mother loved so, "Ida, Sweet as Apple Cider," "Love is the Sweetest Thing," "When They Sound the Last All-Clear." His Uncle Pete taught him to play a banjo. The two of them would sit in Pete's bus, strumming simple chords. And then Walter would sing and they'd both incline their heads towards the PUSH BUTTON ONCE sign, as if the song might be coming from there. Sometimes, it got dark on their banjo sessions, and cold, and the grazing heifers would cluster round the bus, flanks tightly packed, drawn to the body of the old trolley by the blueish light of the Tilley lamp and by the melody. Devotion to things came easily to Walter. Once devoted, he would not be turned aside. In despair about his hopeless schoolwork and the pain of his growing, Ernie and Grace consoled themselves with this devotion of his. Every night before going to his room, he let his mother embrace him and his father give him a comradely pat on the shoulder. He told them he was proud that the name Loomis was known across half the country and that one day the shop would be his. Yet, privately, he had difficulty imagining this. He lacked his father's skill with the knife and his mother's head for sums. And he was happiest outside. "You and I," Pete said to him in the bus one evening, "we're hillbillies, Walter." And Walter grinned, liking the sound of the word. On a night of heavy summer rain, Pete got drunk on whisky. He lay on the floor of the bus with his head propped up by a chair. His wall eye meandered about, looking for a memory. He began to talk about Memphis. He said: "I was a gardener in Memphis in '38. A church gardener." "What's a church gardener?" asked Walter. "Gardener to a church. In this case, Baptist. With three lawns and two beds of annuals and a lot of roses. And what came out of that church was music." "Gospel music. Lovely sound, boy. Used to send me trickles up and down me." He told Walter that he never would have left Memphis but for something that happened there. He said happiness was the main condition in Tennessee, despite the Depression and the bad times. Blacks were faithful there. Dogs were faithful. Even the seasons were faithful. Spring came in an afternoon. Winter tore in on an ice storm. "And the fall, Walter, well, that lets you lie in it an' dream, and out of all the fall-dreaming comes the music." He made Walter get up and look for an old record among his collection of 78s in brown-paper sleeves that he kept in a wooden chest with an eiderdown and some mole traps. "Jimmie Rodgers!" Pete announced. "The Singing Brakeman, The Blue Yodeller! You put that on the grammy and have a listen..."
Walter found the record. He got out Pete's box gramophone and wound it up. The way the heavy, silvery needle arm was moulded to twist over so easily pleased him. He sat down and waited for the scratching of the needle to become song. It was a jaunty tune. It had a kind of clip-clopping rhythm. It was called "The Yodelling Cowboy." Pete made clicking noises with his tongue, keeping time. Walter crouched by the record, watching it go round. The words appealed to him: "My cowboy life is so happy and free/Out where the law don't bother me." He liked to think of men on horseback riding about in what Pete called the fall with nothing to interrupt their happiness. He imagined the golden light that fell on them and the faithful dogs at their heels. But it was Jimmie Rodgers's mastery of the yodel that moved him. It was as if the voice had added a second instrument to its own one-note-at-a-time sound. It took the song up into the sky. "Well?" said Pete, pouring himself the last of the whisky. "I like the yodel," said Walter. "Didn't I tell you? That Rodgers, he could yodel his gizzard off! Play the other side, boy." On the other side was "Frankie and Johnny," a sad number about a man cheating on his love. In this, the yodel was slower and had a sob to it, as if the old singing brakeman were breaking up. The words were easy to remember: "He was her man/But he done her wrong," and on the second time of playing it, Pete and Walter joined in. "He was her man/But he done her wrong!" Pete shook his whisky-laden head from side to side, as though in despair at Johnny's wrong doing and out of the chaos of his eyes fell slow tears like oil. He looked ready to slump down and sleep, but his mind had a last squeeze of sense in it and he kept talking. "I saw him sing once, that old yodelling boy," he said to Walter, "and I never forgot how he talked in between songs. Just saying things. Whatever was on his mind. He'd say to his people on stage: 'Play the tune, Mamma!' and then he'd strum a bit and look at us all out there and say: 'Hey, hey, hey, it won't be long now...' And he got known for that. That was his trademark. 'Hey, hey, hey, it won't be long now.' Lord knows what he meant by it, precisely speaking, but when he said that the audience would clap, you see, Walter? You can imagine that, can't you? Everybody clapping? And thinking to themselves, damn it if he isn't right! Because, in all probability, it won't be long, eh?" Walter put the record back into its charred-looking sleeve. He closed the gramophone. The rain had stopped and he could see a skin of moonlight on the window ledges of the bus. Pete's body had yielded to gravity and his head now lay on the dusty floor. Walter felt light, as if the bulk of his life had gone up into the night sky with the yodel. He thought he should drag Pete onto his bed, but the task seemed to be too heavy for his frame. He just sat still in his chair and made promises to himself. He would teach himself to yodel. He would practise out in the fields and in the sties where no one could hear. He would save up and buy a guitar. He would sing no more stupid wartime songs. From now on, he would learn hillbilly music. He would try to find the soul of it and lie there, like Pete said you could lie in the Tennessee fall, and dream. 1. After studying Arthurian legend in school, Mary swears to protect Lindsey, Pearl, and Estelle. Judging from her own history, what compels her to make this oath and what exactly does she hope to protect them from? 2. The lives of Walter Loomis and Mary Ward parallel at several points in the novel. Though they have different desires, are there underlying similarities to their dreams? 3. Livia, Mary's dead grandmother, is a constant presence throughout the book. Mary often revisits the story of her grandmother's glider accident. What do Livia and her story represent for Mary? 4. From a very young age, the Dictionary of Inventions fascinates Mary. What role does invention and reinvention play in Mary's life? What power does it give her? 5. Many events in Mary's youth, from the night of King George's death to the night she leaves her family's farm, have a major impact on her life. What is the significance of these epiphanies? Do these events have anything in common? 6. Throughout the course of the novel, rural England undergoes a gradual, modernizing transformation. What is this transformation and how is it embodied in Sonny and his family? 7. After Pearl visits Martin in London and reveals her secret, do you think Martin's resulting resentment toward Timmy is legitimate? 8. Sacred Country is told through the narratives of several different characters. How does this affect the story? How did you approach each narrator? Do you find any of the characters particularly sympathetic? More likeable? More easily unlikable? 9. All of the young characters in the book must leave Swaithey in order to grow or to find out who they are. Are there any characters who defy this pattern? If not, why is it necessary for each character to, at some point, leave? 10. At the end of the novel, Martin decides to remain in Tennessee and abandon the final step of her surgery. What about her life in America provides the happiness that she once believed could come only from fully becoming a man? 11. Timmy and Walter grapple with the conflict between obligation to family and obligation to self. There is a large gap between what the characters want to do with their lives and what their families want them to do. Are either of their conflicts ever resolved? If so, how? If not, is resolution possible? The New Yorker A beautiful, knowing novel about isolation and loneliness. The Wall Street Journal An extraordinary novel....spare, pointed [and] extremely moving. The Village Voice Literary Supplement Sacred Country is...about the unexpected and its pleasures, the thrill of rounding a corner and finding something is not at all what you thought, even when that something is yourself...brilliant. The New York Times Book Review A book that we give to our friends and are glad to have read...Tremain gives us a precisely imagined landscape and...characters that we come to care deeply about. The Boston Sunday Globe A stunning achievement. The London Times Evening Standard Sacred Country, by even the most exacting standards, is an unqualified success. The Washington Post The writing in this novel is a sheer delight....skilled, intelligent storytelling at its best. The Literary Review (London) There is no one like Tremain as far as the eye can see....Her book is one to admire and enjoy. It is funny, absorbing, and quite original. I've read nothing to touch it this year. The Boston Sunday Globe Rose Tremain's purpose is to probe and illumine the mystery of identity with particular poignancy and rare compassion....intricate and rewarding fiction. Los Angeles Times Mary's story is superficially bizarre, yet Tremain makes her not just real but moving and blithe....There is a hint of the magical or providential at work.